For 15 years, the lump on Mildred Chitwood’s right breast swelled from the size of a matchstick head to the girth of a tennis ball. She knew it was cancer. A doctor had told her so Dec. 13, 1985, before recommending surgery and chemotherapy. But Chitwood bypassed treatment then because she felt healthy, despite her irate doctor’s claims she would die within 5 years if the cancer was left untreated. 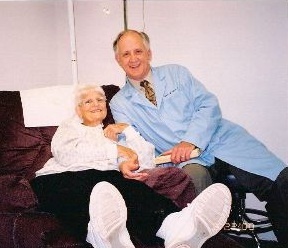 Mildred Chitwood, 76, of Downers Grove, shied away from conventional treatment for her breast cancer and enlisted the treatment of Dr. Steven G. Ayre, who provides alternative treatments in his Burr Ridge office. She had seen too many people-including a 34 year old daughter – go through chemotherapy, lose their hair and their appetite, and die anyway. So for years, she kept the growing lesion covered in bandages, lathered it with a burning black salve touted as a tumor reducer and went on living her life. Last fall, though, the 76-year-old Downers Grove resident started feeling nauseated. Fearful for the first time, Chitwood wondered if the cancer had spread to her stomach. It had not, but the disease had spread to Stage 4, cancer’s most serious form. Chitwood pulled out a clipping she had saved from The Suburban LIFE Newspaper months earlier about a Burr Ridge doctor offering alternative treatments for cancer. She decided to pay him a visit. If nothing else, Ayre is keen on the mind’s ability to help heal. He sees the difference in patients who have hope and those who do not. He sees how positive-thinking people grow stronger despite debilitating disease. “Resentment has an impact on the immune system. Getting to ‘it’ and resolving ‘it’ in a natural and empowering way requires doing things we are not inclined to do. (But) there’s something they can do, and I can help them,” Ayre said, leaning back in his desk chair. “By the time I see patients they’ve already been through the mill. When you’re on traditional chemotherapy you’re sick and nauseous. You’re not doing a lot of tai chi and yoga and eating your sprouts.” Instead, Ayre advocates a low dose chemotherapy called Insulin Potentiation Therapy. At doses 75 to 90 percent less than traditional chemotherapy, IPT works by first injecting insulin into the body, which enhances cancer cells absorption of the chemotherapy. Less chemotherapy then is needed to kill the cancer cells, Ayre contends. Patients then receive glucose injection to counter insulin’s ability to lower blood sugar levels. Though the process has been used in Mexico and abroad for years, only a handful of physicians in the United States use IPT. Few clinical trials have been done on the subject, but that may change. Later this month, after 25 years, Ayre is scheduled to present several case studies showing clinical results of IPT before members of the cancer advisory panel for the Center for Complementary and Alternative Medicine at the National Institutes of Health in Bethesda, Maryland. If NIH officials see promise in Ayre’s work, they might fund future studies to officially document the treatment’s pros and cons. Ayre, 55 said, “I’m not afraid of my own feelings, of connecting with patients. I’m really good at that. It’s a dramatic thing, this whole cancer experience, because people die.” As she sits in the burgundy recliner in Ayre’ office, Chitwood tugs at her blouse. The IPT treatments often make her hot. A nurse fills a rubber glove with cool water and ties it off like a balloon; Chitwood occasionally presses it to her neck to cool off. Getting cured of the cancer at this stage would be a miracle. But for the first time in months, Chitwood is able to walk down her driveway, sit on her porch swing and order compact discs by phone at 11 p.m. The lesion on Chitwood’s breast has, in fact, shrunk. Ayre says little about Chitwood’s prognosis. He sees progress, but also said he does not believe in continuing treatments in vain. Both he and his patient are in a wait and see mode.